It actually makes great sense but who would have thought this? What is quickly obvious though is the the range is excellent and that this suggests that laying a listening grid will ultimately allow continuous mapping of population locations that is otherwise impossible. The commercial value is obvious, but stock management is also suddenly plausible. All good news for future sea management. The recordings were captured by two sea-noise loggers: the first positioned near the Port Headland shore and the second 21.5 kilometres away in offshore waters. 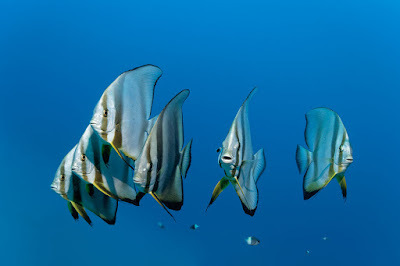 Listening to choruses over a long period of time allows scientists to monitor fish and their ecosystems, particularly in low visibility waters, such as those off Port Headland.